Save-On-Foods is a chain of grocery stores located in Canada. The company is owned by the Jim Pattison Group and is a subsidiary of another supermarket chain, the Overwaitea Food Group. Save-On-Foods has its headquarters in British Columbia, Canada. Save-On-Foods was founded in the year 1982 and has since been operating in the area of Alberta and British Columbia. Like its sister chain Overwaitea, Save-On-Foods stores sell private label products and national brands. The stores private labels are Western Family, Good and Kind, Western Classics, Body Zone and Value Priced. These products are also sold in Overwaitea grocery stores. In Alberta, Save-On-Foods started operating its first store in 1990. This first store was located at Mayfield Common in the area of Edmonton. 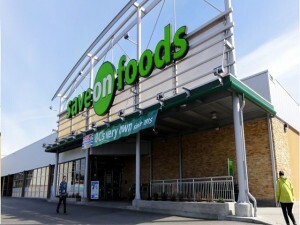 Two years after, Save-On-Foods launched its loyalty program for its customers, along with the loyalty card Save-On-More. This loyalty card is still accepted at all Save-On-Foods stores, as well as in Chevron gas stations. Like its sister chains, Save-On-Foods also offer weekly sales and promotions, such as store coupons. A number of Save-On-Foods stores include a pharmacy and there are also stores that offer other services. These other services are nutrition stores, photo labs, health clinics and recycling centers. Today, there are 24 Save-On-Foods stores in Alberta and 53 Save-On-Foods Stores in British Columbia. In Alberta, there are stores in the area of Edmonton, Grande Prairie, Red Deer, St. Albert, Fort McMurray, Lethbridge and Sherwood Park. In British Columbia, Save-On-Foods has stores in the area of Abbotsford, Burnaby, Chiliwack, Cranbrook, Fort McMurray, Kelowna, Maple Ridge, Nanaimo, New Westminster, Parksville, Penticton,PowellRiver, Quesnel, Saanich, Surrey,Vancouver, and several other locations in the region. In the past, a number of Overwaitea stores were converted to the Save-On-Foods format. This happened when the Jim Pattison Group acquired the Overwaitea chain. The stores were converted to the Save-On-Foods format during from the 1990s until the 2000s, when the chain was undergoing renovation and expansion. Save-On-Foods’ other sister chains include Urban Fare, PriceSmart Foods, Bulley Valley Wholesale and Cooper’s Foods. The grocery chain is also the namesake of British Columbia’s Save-On-Foods Memorial Arena. Today, my girlfriend was not allowed to re-cycle our pop cans at the Terrace Save-On store even though we had already paid the recycling fee and had bought the product at your store. Is that legal, firstly? Secondly, if you have enough space for the pop, and take the re-cycling fee, why wouldn’t you have enough space for the empties? I am awaiting a reply within a month. Could you please let me know what ingredients are in the Dragon Box mix in your bulk food section? Last year or maybe even the year before, when I was shopping at Save-On-Foods in New Westminster, BC, I was given “Body Zone” samples for shampoo and conditioner. It is the best shampoo and conditioner I have ever used on my hair. When I went to buy it, I was told that the store had decided not to carry it and they referred me to Overwaite. I contacted Overwaite and was advised they do not carry this product either. Still Body Zone is mentioned on your web pages and even in Wikipedia. Is it possible some of the private chains of yours carry this product? In the alternative, would you please advise me who manufactures it, as they may have other outlets.